Copernicus had those Renaissance ladies Crazy about his telescope. 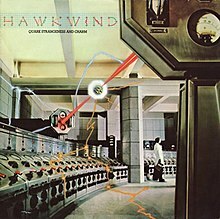 Hawkwind does sci-fi pop. The title track, Quark, Strangeness and Charm is actually professor Brian Cox’s, the metrosexual Magnus Pike, favourite Hawkwind track. I actually just made that up, it is The Iron Dream. Even though Nik Turnerless, it is still a good album, and quite commercial. My favourite track by far on this album is the wonderful multi-layered Hassan-i Sabbah. A political song of sorts about the Middle East through the eyes of Opium, I guess they just wanted to experiment with different hallucinogens. The track Animals is basically proof, if more proof were indeed needed, that Davey Byrne is a few Penguin Classics short of a set. When I first heard this album I really didn’t get it, it didn’t fit the narrow, jaundiced version of New Wave that I had created in my head. It sounded, all foreign. When I finally got the music, then I started to consider the lyrics, I am still coming to grips with those. The track Heaven is still musically a big furry blanket of a song, every so often I like to wrap myself in it, tonight is one of those times. An aside; I would still pay good money to see Talking Heads do one last tour.